In the survey, Farm Journal asked farmers what their primary marketing plan is for this year's crops. 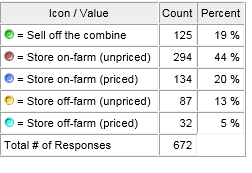 Of the 672 farmers who responded, 44% of them (294) say they plan to store their crop unpriced on the farm. An additional 13% is storing grain unpriced, off the farm. See full results of the survey in the chart below. "That's not always a bad decision, as long as they're consciously not doing anything with the crop--that they're not simply procrastinating," he says. Recent improvements in trade agreements between the U.S., Mexico and Canada, and also South Korea, are main drivers for farmers' decisions to delay marketing. Plus, there is the potential for more trade agreements, Flory notes. "We're also going to be negotiating a trade agreement with Japan," he predicts. "The goal, Sonny Perdue told me, is to have a TPP-plus (Trans Pacific Partnership) type agreement. India could be next. These could be good templates for trade agreements moving forward." "There's going to be some of that 'bin it and forget it' mentality this year, because farmers anticipate this market is going to recover, that we'll see some price improvement in the months ahead, and they'll be able to market for a profit in 2019," he says. "They're waiting on prices to get back to break-even."